Arctic Records opened for business late in 1964. The label was the brainchild of Jimmy Bishop, the program director of WDAS — at the time Philadelphia's No. 1 black radio station. If that sounds like a conflict of interest, you don't know much about the music business in Philadelphia back then. Besides, it didn't help Arctic's first single, "Happiest Girl in the World" by the Tiffanys, three local teenagers who sang backup in various studios. But it was only a few months later that Arctic had its first — and only — national smash, thanks to a young girl who'd caught the ear of Weldon McDougal, lead singer of the Larks and a good friend of Bishop's. 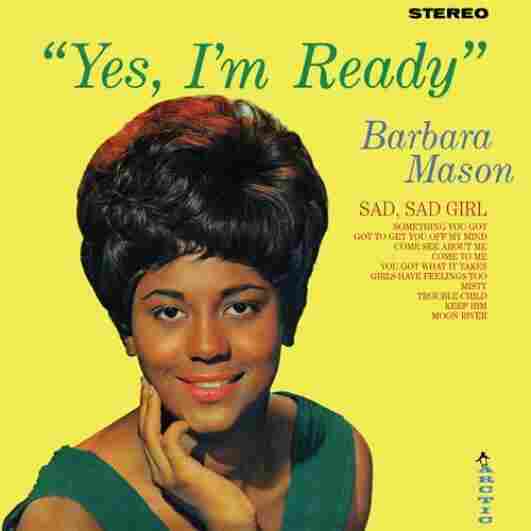 Barbara Mason had had one minor hit on Arctic by the time "Yes I'm Ready" came out in March 1965. Backed by the Tiffanys and three guys — Weldon McDougal, Kenny Gamble and Herb Johnson — Mason's untutored, straightforward delivery sold the song, which she says she'd written in imitation of Curtis Mayfield. It went Top 10 on both the R&B and pop charts and established both Mason and Arctic as forces to be reckoned with. Following it up, though, wouldn't be easy: Soul music was catching on in a big way, and although Jimmy Bishop thought of himself as Philly's answer to Berry Gordy, Gordy had more talent that he'd been developing longer. Honey and the Bees were four young women who made a number of singles for Arctic, some good but not spectacular. Then there was the problem of coming up with a male group — which, in a city like Philadelphia, should have been no problem. You can't hear it here, but the Ambassadors, Arctic's main male group, suffered from an inability to sing in tune, as well as a lead singer who wasn't as strong as he should have been. The label also had the Volcanoes, one of whom sported a hairdo that looked like a mushroom cloud, and another problematic group called the Temptones. The problem with the Temptones sure wasn't talent: The group had beaten both the Ambassadors and the Delfonics in a contest at the Uptown Theater. It wasn't their name being too close to the Temptations: The Temptations' members were fans and offered management advice. No, it was the fact that the Temptones, whose name had been modified from Templetones because the group all went to Temple University, were white. Lead singer Daryl Hohl had a great voice, and they could dance like crazy. Without anything but local success, though, they eventually fell apart, and Hohl changed his name to Hall — and, with their guitarist John Oates, moved to Atlantic Records, which knew a thing or two about white soul. Around the time the Temptones were falling apart, so was Arctic. Kenny Gamble, who'd been a singer and an engineer, started concentrating on running the mixing board along with his friend, keyboardist Leon Huff; they started writing songs together, like "What Does A Man Do," a B-side from 1967. The group that performed it, Harold Melvin and the Blue Notes, only made one record for Arctic, but Gamble and Huff kept in touch, and the next time they saw the band, it was an entirely new group except for Melvin. His drummer, Teddy Pendergrass, had a pretty good voice. Arctic definitively fell apart at the end of the 1960s, and released its last record in 1971. By that time, Jimmy Bishop had disappeared entirely, and to this day nobody knows what happened, although rumors of his preaching in Mississippi have surfaced. Barbara Mason, Hall & Oates, Gamble and Huff, and the studio band that coalesced around the label and became the house band at Philadelphia International, though, have every reason to thank him for starting Arctic Records.